Fall is definately here, though many people I know don't like to hear me say this. I love the Fall. It's my favorite time of year. To be perfectly honest, I've had enough of the heat and humidity for awhile. 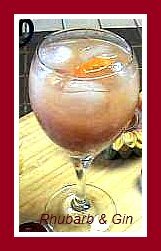 We're definately sure to get more warm weather again, so here's a good thirst-quencher for a group. You can always remove the alcohol to make it "kid-friendly." Double up on the strawberries, and use more ginger-ale and lemonade. Combine all ingredients into a large pitcher, and let it sit for one hour. Garnish with lemon and strawberry pieces. Prefer the "comfort" foods on a cooler day? More emphasis on the ginger in this crisp recipe. Grease a 9 x 13-inch baking dish or two 8 x 8-inch pans. Mix the sugar, 3 tblsp. of flour, salt, eggs, orange juice, and ginger together in a bowl. Add the rhubarb. Pour the mixture into the greased baking dish. For the topping, combine one cup of flour, brown sugar, butter, and cinnamon by pulsing in a food processor or blender. Stir in the oatmeal; crumble the oatmeal mixture over top the rhubarb. Gently pat the topping down. Bake on the center rack of your oven until the topping is golden, the rhubarb is tender, and juices are thick and bubbling. Bake at 350 F. 50 minutes. Cream butter and brown sugar; mix in the egg. Mix flour, soda and salt together, then add with sour cream to creamed mixture. Fold in rhubarb and berries gently. Mix nuts, sugar, cinnamon and butter, and spread over top. Pour batter into 9x13 pan. Bake at 350 F. for 40-45 minutes or until knife comes out clean. Cool on a wire rack. Serve warm or cold, with whipped cream. Rubbing your hands with lemon slices or juice will remove odor caused by onion or garlic and it will also remove stains from berry fruits and rhubarb too. 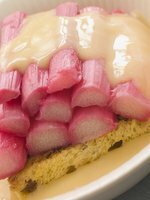 Rhubarb is so popular in Sweden! Bake in a 10 inch pie plate and use margarine or oil for greasing the dish. Pre-heat your oven 375 F.
Mix all the dry ingredients for the crumble in a bowl. Add the margarine and mix well using your hands or a mixer. Make sure all the margarine has been mixed in well. 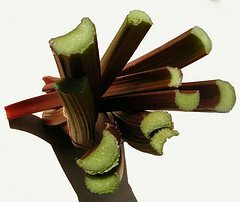 Clean and peel your rhubarb stalks and cut them into finger thick slices. Grease your pie-plate with a bit of margarine or light oil, and add half of the crumble mix. Gently tap to form a loose base for the rhubarb. Add all your rhubarb pieces and sprinkle with sugar and drizzle with golden syrup. Add your margarine in small pieces evenly spread over the filling. Add the remaining crumble mix over top of the rhubarb and bake in the oven for 35 minutes. Are you a fan of cider? The market definately says so of those in the UK, as the total cider market has grown over 60% in the last five years. Magners, a very popular brand of cider which is produced in Ireland has launched some new flavors much to the delight of their customers. Spiced apple and honey, ginger and pear, and apple-spiced rhubarb are on the shelves now in Tesco, Sainsbury's and Waitrose. Ciders are viewed by Magners as for "special treat occasions; a nice cold drink to enjoy in a bar or at home." Heard of a Hobo Wedding? Rhubarb plays an interesting part. Interesting item in the news from Louisville Kentucky recently. A "hobo" couple, who enjoy riding the rails, picking up odd jobs when they can, are stopping long enough to tie the knot. The wedding will be traditional in most ways. There will be the bridal wedding dress, best man, bridesmaids, a wedding cake, and usual exchange of vows and rings. Some rhubarb will be present too as a "symbol." The rhubarb leaves are poisonous, and are burnt. This represents taking all of the things that are bad and unwelcomed away from the wedding day itself. The rhubarb stalks are good, and so they are kept. This represents everything that is good and pure. So, if you want to have a wedding "hobo-style" better have some rhubarb on hand to seal the deal. August was "rhubarb month" at EdiTORIal, a blog hosted by Tori Spelling on all sorts of subjects. I submitted my rhubarb and gin cocktail and it got posted which was great. 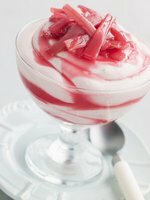 If you want to check out some other great rhubarb recipes there, take a look. When you get there, you will see different subjects across the top; just go to "Eat" and then scroll down. Different rhubarb recipes are posted - I think rhubarb and white chocolate muffins is the first one.